If there is one area you can really save just by axing the trimmings, then it’s the food. Food does not have to be lavish to be tasty. Quite the reverse, actually. With some thought and imagination, you can feed the hungry masses with hearty homemade fare, or at least not the usual catered, over-priced type of meal that has become the standard for weddings. Give venues with pre-set menus a wide berth – some wedding venues insist on pre-ordained meals as though your wedding were nothing more than ‘yet another wedding’. If you can try to negotiate for something you and your partner would most like to eat, ask if you can get an external caterer in, or do the catering yourself, you are more likely to be able to watch your pennies and end up with a menu to be proud of. Get married in the afternoon or early morning – by going for brunch, or an afternoon full of heavenly appetisers, you will save money. Evening sit-down dinners are always more lavish and thus more expensive. Do playful brunch with an endless supply of dainty egg and bacon quiches, tarts to make the average queen blush, and strawberries and cream, whilst afternoon appetisers can include gourmet cheeses and artisan breads, a salsa bar, mini gourmet sushi, local vegetables and fresh fruit. 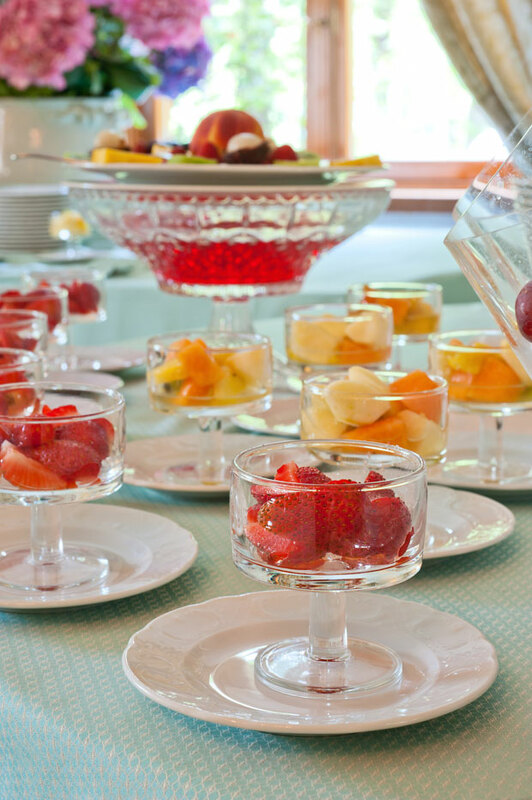 Do it yourself – we’re not talking the whole meal here, but certainly the dessert table can easily make the grade if you and your friends use a little imagination. Cupcakes, wedding cookies, nick nacks and delicacies are not difficult to make. If you and each of your friends were to bring but one dessert, presented on vintage plates and bowls, you will have saved half your food budget. Do it buffet-style and limit the number of drinks served – a lavish, artful display of food on a table looks impressive, but doesn’t have to be expensive, whilst limiting the amount of alcohol served immediately saves the pennies. Accept any offers of help – just because it’s your wedding, does not mean you have to do it all yourself. If you have eager friends who are whizzes in the kitchen, wave them through and tell them to go wild!